As further illustration of the growth rate of DOAJ: as of today, DOAJ includes 3,587 journals , and has added 63 new titles in the last 30 days, more than 2 new titles per day (and it's August!). 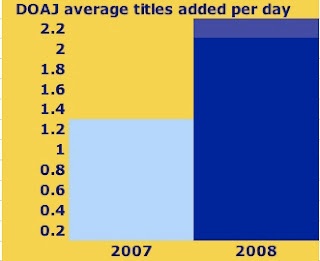 Since September 30, 2007, DOAJ has grown from 2,846 titles, an increase of 741 titles in 11 months, or 330 days at 30 days/month, for an average net growth of 2.2 titles per day. In the September 30, 2007 Dramatic Growth of Open Access update, I noted a growth rate of 1.2 titles / day for DOAJ over the previous year. This post serves two purposes: as yet another illustration of the Dramatic Growth of Open Access, and as the starting point for an illustration of the use of Creative Commons. Watch Social Justice Librarian for the next step in the illustration. The open access movement in Canada is very active in many areas. This is not surprising; of the 16 people at the Budapest meeting which was the foundation of the Budapest Open Access Initiative (BOAI), three were Canadians, all global leaders in this arena: Leslie Chan, Jean-Claude Guédon, and Stevan Harnad. The Canadian Association of Research Libraries (CARL) was among the earliest signatories of the BOAI, and quickly initiated a nationwide institutional repository program. The Canadian Library Association (CLA) recently approved an innovative “Position Statement on Open Access for Canadian Libraries,” calling for all libraries to participate in advocacy, educating patrons abut open access resources, and encouraging support for open access, including economic support. The Canadian Institutes of Health Research (CIHR) has an open access mandate policy, requiring open access to CIHR-funded research within six months. The Social Sciences and Humanities Research Council (SSHRC) has an Aid to Open Access Journals program. Other funding agencies in Canada either have, or are developing, open access policies and support. This article presents an overview of CLA advocacy and open access in Canada, with a focus on initiatives with a strong library involvement or leadership. Also available in E-LIS and the SFU D-Space. Copies coming soon to an institutional repository or two. Two good news announcements from open access publishers! Public Library of Science and the Max Planck Society have signed an agreement where Max Planck Society will pay all article processing fees on behalf of their authors. Hindawi Publishing has announced their Institutional Memberships. Interested libraries can now arrange with Hindawi to cover article processing fees for open access on behalf of all authors in their institutions. Kudos to Hindawi, PLoS, and the Max Planck Society! This post is part of the Resources and Tips for Publishers series. This post is a brief summary of an open access panel discussion at the Engineering in Medicine and Biology Society (EMBS) meeting in Vancouver, August 22, 2008. EMBS is a part of the IEEE (international engineering association). IEEE has been a leader in green self-archiving policy since 1995, allowing authors to self-archive on their own web pages or institutional repositories, with no embargos, and even the publisher's PDF - but oddly enough, not disciplinary repositories such as PubMedCentral. IEEE is now, like many publishers, considering a gold open access option for authors. This could be a very interesting discussion process! Based on yesterday's meeting, IEEE should probably assume that if they ask their authors to pay article processing fees, they can expect in-depth questions about why the fees are so high. Naturally, engineers will have many, many ideas about how to do things better, and for less, too! I look forward to hearing more as engineers progress towards open access; I have a hunch the ingenuity of this group has much to contribute to scholarly communications, for the benefit of all of us. My advice to EMBS, and IEEE: keep the great green policy - and add disciplinary repositories, with no embargo. Ask the advice of your members; they have lots to contribute! If you come up with an optional OA program, consider allowing members to offset fees with their volunteer work. Be sure to lower library subscriptions to reflect revenue, and develop library membership schemes so that libraries can pay some, or all, of the fees for their authors. along with Andrew Laine, EMBS Vice President of Publications, Brian Owen, Public Knowledge Project / Associate University Library, Simon Fraser University Library, and Bruce Wheeler, Editor, IEEE Transactions in Biomedical Engineering. The discussion was moderated by Jennifer Flexman, who prepared a useful overview of open access and some key resources. In some ways, IEEE has been a leader in green open access since 1995! IEEE's leading-edge green Electronic Information Dissemination policy allows author self-archiving - of preprints, postprints, and even the publisher's PDF, on the author's or company's servers (which would include institutional repositories). There is no embargo, and the only stipulation is an appropriate acknowledgement and pointer to the publisher's site. Oddly, IEEE stipulates a 12-month embargo on self-archiving in PubMedCentral. This is just silly! IEEE is in the process of planning on moving to the next phase, into gold. Based on Andrew Laine's talk, clearly the IEEE has heard that their current author agreement which requires full copyright transfer is rather outdated. Watch for a libre aspect to IEEE open access, as clearly there has been discussion on topics such as data mining. My talk covered the basics of what OA is, including green & gold, gratis and libre, and brief highlights of open access policy, such as the U.S. National Institutes of Health, the Canadian Institutes of Health Research, Wellcome Trust Open and Unrestricted Access, the Harvard Faculty of Arts and Sciences granting a worldwide, nonexclusive license to their works to Harvard, and, to illustrate that this is just the tip of the iceberg, the European Universities Association unanimous commitment to an OA policy in every university in Europe, with yesterday's Ireland Higher Education Authority being but the latest example. I wrapped up with some thoughts on author's rights, using a License to Publish and leaving copyright with the author, and Creative Commons options. Brian Owen talked about his work with the Public Knowledge Project and Open Journal Systems. PKP is working on a new count of journals using OJS, and anticipates confirmation that the numbers are now above 1,900 in the near future. Perhaps some of the OJS features might be of interest to the IEEE, particularly the Lemon8 automatic conversion to XML, and advanced reader features? Bruce Wheeler talked about his work with Transactions on Biomedical Engineering, the flagship journal of the EMBS, outlining the editorial process, highlighting the thoroughness of the reviewers. Bruce talked about the food chain of expenses. His time is paid for by his employer, or taken from personal time. Like many EMBS journals, Transactions on Biomedical Engineering is produced in both print and electronic form. As an IEEE journal, Bruce nevers need to worry about the subscription tracking. Andrew Laine explained that society revenues are determined by hits on the different society journal packages. This is no doubt a complexity of OA for the society; if usage is through open access copies rather than the publisher's website, IEEE will need to figure out a different way to split monies between divisions. The real highlight, for me, was the discussion. The IEEE is considering offering an open access choice alternative for authors, and a possible fee was discussed. At first, I very politely declined to comment on this fee, although to me it seemed rather high. I was delighted when both Brian Owen and Bruce Wheeler said exactly what I was thinking, that the fee was too high, and that $500 would be much more realistic! I didn't even mention the Imaginary Journal of High-End Chemistry, a series in which exactly this point is made! Will this fee cover perpetual access to my work? Do we even know how to preserve information in electronic format? What about credit for volunteer work to cover the cost of publishing? This could be copyediting, reviewing, editing, or scanning those older monographs (IEEE would like to make all monographs more than 3 years old OA, once a means can be found to do this). EMBS was just having a discussion about how to recognize such volunteer work, so it is very timely for this discussion. Why not have authors do their own copyediting? Can't papers in electronic form be different - more content, audiovisual, etc.? One of the challenges for IEEE is that libraries continue to want print as well as online, particularly for the images for which this society is known. If IEEE moves to article processing fees, won't there be competition? Absolutely! It's a good thing IEEE is planning to keep their green leading edge. Most open access publishers don't charge any fees at all, and others have competitive fees. Competition is a good thing; the serials crisis came about, in part, because of an inelastic market, and the readers being sheltered from payment was a factor. There were many other good questions and suggestions, I only captured a few. http://www.moj-blog.org/web-access (accessibility of web for people with disabilities. Mike Dunford on The Questionable Authority has calculated Elsevier profits (STM and Health & Sciences Division) at $1,750 per minute. This is based on the Reed Elsevier 2007 Annual Report. According to the Reed Elsevier 2008 Interim Report, downloadable from the Reed Elsevier website, Elsevier is working to cut costs. Elsevier also has an optional open access program, charging $3,000 per article; one assumes at least some authors must be taking advantage of this. If costs are cut, there is a new growing revenue stream, and prices are still going up - does this mean profits will continue to increase? An increase from a 31% profit margin (for 2007), would be a very healthy profit indeed. Moving to cut costs when the company's profits are this healthy is certainly an interesting move. If a company thought open access was the way to go, but did a little number-crunching and figure that costs would prohibit a shift to OA via article processing fees, then cutting a few costs here and there would make sense, wouldn't it? What would make even more sense from a business perspective for both the short and the long term: cut costs, but also cut prices by at least as much as you're saving from cost-cutting, and from author's fees. Even without cost-cutting, or factoring in author fees, a 10% decrease for all library subscribers still leaves a far-above-average 21% profit rate. Plus, library subscribers would have some cash to pay those author's fees; this approach could greatly facilitate a gradual transition to open access. (Use author fees to offset subscription prices; next year, libraries have more funds to contribute to author fees, etc., essential a reversal of the pricing spiral of the serials crisis). STM journal prices for the past few decades have rised far beyond inflation, and far beyond the ability of libraries to keep up. For long-term success, a business needs healthy, happy customers. This would also be a good success item to report, for Elsevier's new Corporate Responsibility Division. Friday, August 22nd: participating on a panel on open access at the 30th Annual Conference of the Engineering in Medicine and Biology Society in Vancouver (with Brian Owen and EMBS journal editors). News Feature in the next College and Research Libraries News on Open Access in Canada, entitled Open Access and Evolving Scholarly Communications: An Overview of Library Advocacy and Commitment, Institutional Repositories & Publishing. This fall, I am co-teaching LIBR 561: Information Policy, at the University of British Columbia's School of Library, Archival and Information Studies, along with Devon Greyson of Social Justice Librarian. Students are expected to attend the BCLA Information Policy Committee's conference, Jumpstarting the Public Sphere, October 22-23, 2008 in Vancouver, featuring keynote speaker Michael Geist, followed by Media Democracy Day on October 24. Watch for further details in the near future. Andrew Waller and I are in early stages of planning for a CLA Open Access Interest Group, to carry forward the work initiated by the Open Access Task Force. I am in the midst of writing a book called Scholarly Communications for Librarians for Chandos Publishing, due out in March 2009. Two chapters will be open access (no decision on which ones, yet). With Don Taylor (SFU Library), in preliminary stages of planning a research project on support for open access at Canadian libraries. Watch for further details on the Open Access Directory Research in Progress page. As Michael Geist points out, there are a number of serious flaws with Canada's proposed copyright legislation, Bill C-61. In last Friday's post, Michael talks about Unnecessary coverage of circumvention devices. Michael's post raises, for me, some important points. Is it even legal to use digital rights management technology, especially if it is used in such a way as to prevent perfectly legal uses (such as private copying)? If it is - should this be reexamined? Imagine this concept applied to other areas. Picture buying a car and paying appropriately, filling your half of the contract. Then you try to start the car and guess what - it doesn't work! You ask the salesperson about this, and they explain that they've added DRM to your car, and you can't legally circumvent it! For an extra few thousand, they'll circumvent it for you. Does this sound like something appropriate or legal? This is exactly what Bill C-61 does! If we're going to talk about policy on digital rights management, why not make this a two-way conversation? What about our rights as consumers, and as citizens? If a company is selling a product that includes spyware, do they not have an obligation to disclose this before we purchase? Your child's misuse of our intellectual property could result in up to $20,000 in fines. If you rent this movie, you will be forced to watch advertisements and previews. Alternatively, if the entertainment industry would really like my consumer dollar, here is the notice to post: DRM FREE. Many thanks to Michael Geist, the people of Fair Copyright for Canada, and my librarian colleagues for all their work, appropriately fighting this unfair and unbalanced proposed legislation. Oxford University has announced that OUP will deposit NIH-funded articles into PubMedCentral on behalf of the authors. Combined with OUP's enlighted open choice options, which provide immediate open access on payment of a fee, with a creative approach to combining these fees with subscription revenue that is a good model for other publishers looking for a means to a smooth transition to open access. In brief, this model involves providing discounts to authors of subscriber institutions, and using monies from open choice fees to offset subscription costs. Kudos to OUP, and thanks to Kirsty Luff, OUP. In the August 2008 SPARC Open Access Newsletter, Peter Suber articulates a distinction between open access that is gratis and libre. Gratis means free (as in price). Libre means free (as in free to use). This is an important distinction - we need both kinds of free, but in the transition period strides are often likely to be made in one kind of open access at a time. All moves forward are very welcome. The terms mirror those of the open source software community; while they are new, they have the advantage that most of us do not have prior conceptions of the terms. With the funding agency mandates, which tend to focus, for good reason, more on gratis OA, much progress has been made. Now, it is timely to begin talking about how we can now begin to use information on the world wide web, to take advantage of this wonderful medium. Since IJPE is not a peer-reviewed journal, the focus of the open access movement, it is not quite accurate to call IJPE OA - even though it is gratis, libre, and scholarly in nature. The libre aspect of IJPE is legally expressed in the IJPE Creative Commons license - Attribution / Noncommercial / Sharealike. Attribution: as an author, I would like credit for my work, so please cite it and include URLs to IJPE blogposts! Another way to look at this: if you think there are some good ideas on IJPE, please share them with others in a way that they, too, can share - this means maximum impact for the work that I share on IJPE. Noncommercial: if you think there is commercial value in IJPE, perhaps a commercial market for a book or movie based on the blog - let's talk! On the other hand, if an idea you read about on IJPE inspires your entrepreneurial spirit, to me this is not a commercial use of IJPE per se; ideas are not covered by copyright law. If I want to restrict use of an idea for commercial purposes, I should seek a patent. Sharealike: feel free to make derivative works of IJPE - translations, a version of a blogpost more suited to a particular readership, etc. If you plan to Sharealike (share your work openly, too), there is no need to seek permission. If you'd like to limit your work, presumably because your motive is profit - that's commercial use, so again, let's talk! Sally Morris (former Executive Director of the Association of Learned and Professional Society Publishers, ALPSP) quotes a major ALPSP study of more than 11,000 authors, published in 1999, What Authors Want, as finding that more than half of authors wanted to retain copyright, rather than relinquishing their copyright to publishers. One of the authors of the study, Alma Study, also refers to more authors wishing to retain than to relinquish copyright. This is a study published in 1999 - more than two years before the initial Charter of Creative Commons, and long before today's Author's Rights Movement. Sally's quotes can be found in her article, Authors and Copyright, Learned Publishing, Volume 13, Number 2, 1 April 2000 , pp. 75-76(2). Sally Morris' article in Learned Publishing is free. The ALPSP study, however, is not. I wonder why? The Association of Learned and Professional Society Publishers (ALPSP) included some very progressive language providing for authors to retain their copyright. While this ALPSP / Learned Publishing License to Publish is dated 2000, this language could still be a role model for publishers! Copyright remains yours, and we will acknowledge this is the copyright line which appears on your article. However, you authorise us to act on your behalf to defend your copyright if anyone should infringe it, and to retain half of any damages awarded, after deducting our costs. You also retain the right to use your own article (provided you acknowledge the published original in standard bibliographic citation form) in the following ways, as long as you do not sell it in ways which would conflict directly with our commercial business interests. You are free to use your article for the internal educational or other purposes of your own institution or company; mounted on your own or your institution's website; posted to free public servers of preprints and/or articles in your subject area; or in whole or int part, as the basis for your own further publications or spoken presentations. From: License to Publish Learned Publishing, Volume 13, Number 2, 1 April 2000 , pp. 74-74(1). (Free content). This post is part of the series of resources and tips for publishers. Canadian Association of University Teachers (CAUT) advises copyright retention! The Canadian Association of University Teachers (CAUT) has issued an Intellectual Property Advisory, advising scholars to retain their copyright, and providing advice as to how, including use of the SPARC Canadian Authors Addendum! The purpose of this advisory is to assist academic staff in retaining copyright ownership in the articles they publish in journals. Without copyright ownership, academic staff can lose control of their own work and may no longer be entitled to email it to students and colleagues, post it on a personal or course web page, place it in an institutional repository, publish it in an open access journal or include it in a subsequent compilation. Thanks to Kenneth D. Gariepy for the tip, Paul Jones, CAUT, SPARC an CARL!